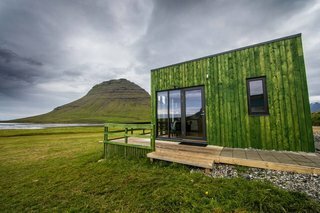 There are so many great reasons to visit the tiny island nation of Iceland—here's where to stay. 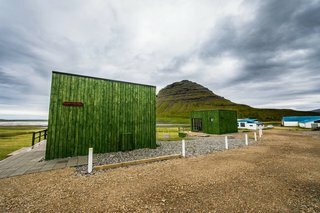 The geothermal-powered country is home to hot springs, geysers, and the largest glacier in Europe. The winter months are cold, long, and dark—but the beauty of traveling there from October to March is that you can partake in some of its many winter sports, explore ice caves, and even catch a glimpse of the Northern Lights (Aurelia Borealis). 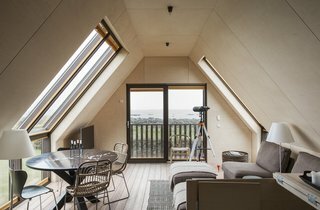 Here, we've rounded up 10 modern rentals that would be perfect to use as a home base while exploring this beautiful Nordic nation. 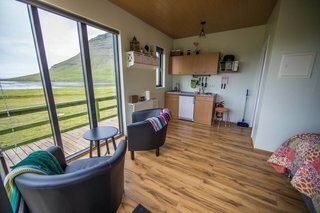 Situated at the base of mount Hafnarfjall along the shores of the Snaefellsnes peninsula, this traditional clapboard house was built in the region's classic country house style from the 18th and 19th centuries. 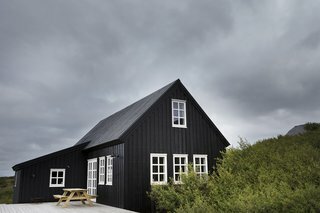 Built entirely of timber, the cottage is painted in a deep black hue that was originally derived from natural tar to withstand the elements. 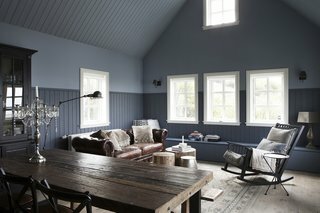 The interiors were designed by Icelandic designer Rut Káradóttir. 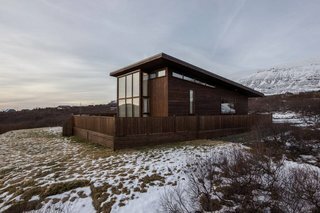 This weathered-wood, contemporary villa in northern Iceland boasts beautiful views of the bay and surrounding nature. 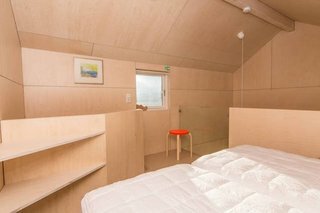 In the winter, you can go skiing, dogsledding, and catch the Aurora Borealis. 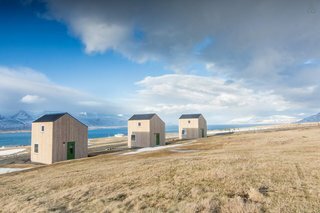 Summertime promises picturesque hiking tours and a chance to experience the midnight sun. 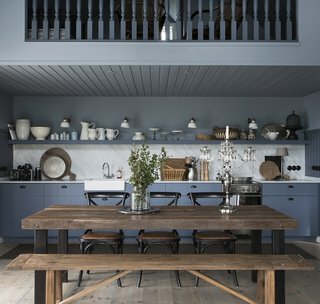 This home is the collaborative creation of Los Angeles-based architects and native Icelanders, and focuses on environmental design. 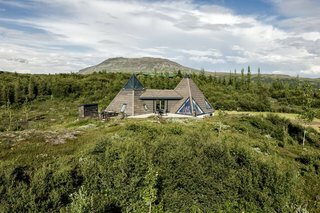 A modern homage to the traditional mud houses of Iceland, the property is located along the "Golden Circle" route in a quiet, rural area just inland from Reykjavik. 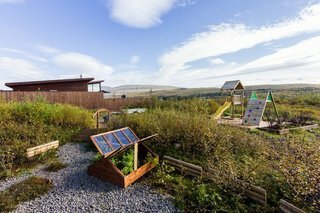 It features clean and sleek contemporary lines, a green roof, and a simple, eco-conscious design. 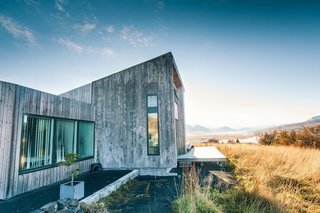 Situated along the southern coast of Iceland, just southeast of Reykjavik, this eco-friendly home features incredible views that look out over the rugged lava-lined coastline. 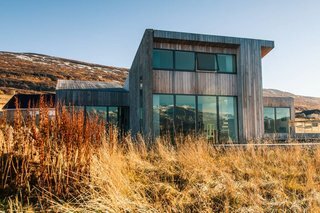 Clad in weathered timber, the materials and placement were designed to tread lightly and adapt to the environment with geothermal and hydroelectric power. 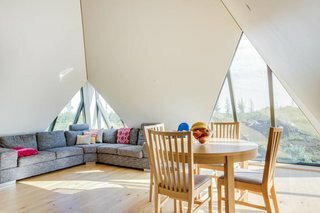 The two-story A-frame provides bright and spacious interiors. 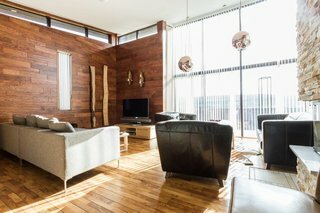 The living, dining, and kitchen areas share the upper floor, with the master bedroom overlooking the coast, while the two additional bedrooms are on the ground floor. 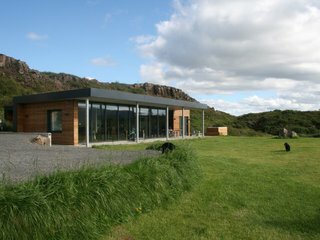 This new spacious villa features stunning views, a convenient location, and an outdoor jacuzzi. 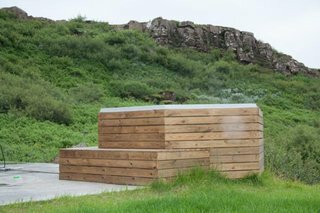 It's the perfect spot for a relaxing family getaway or for exploring the interesting sites that surround the northern capital. 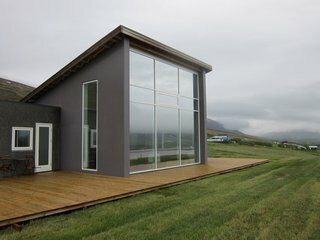 Located in southern Iceland close to the Golden Circle, this new modern home offers panoramic views and a stream that runs through the property. 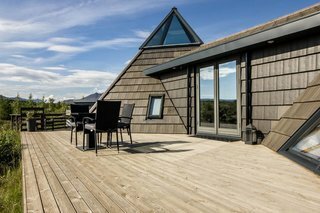 The four-bedroom house also boasts an outdoor trampoline and a large terrace with a hot tub that can accommodate 10 people. 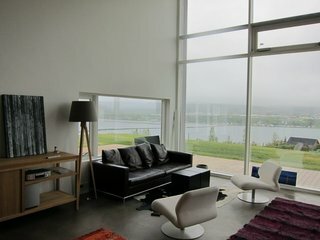 Opened in 2015, this house is one of three new modern homes on the Sunnuhlíð farmland with picturesque views of Eyjafjörður and Akureyri. 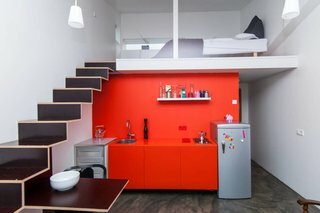 The homes are all identical and are perfect for couples or small families traveling on their own. 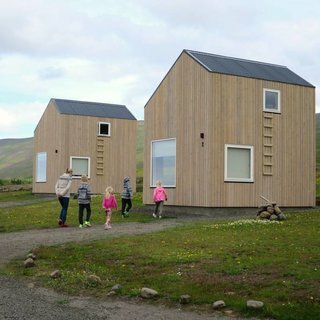 The owners of these cabins live on a nearby farm and invite guests to experience Icelandic "farm life" on their homestead as part of the package. 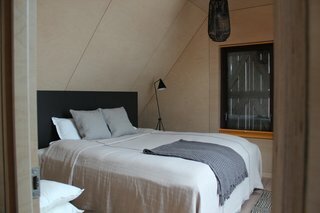 They recommend that guests book at least two nights as there are so many things to see and do in the surrounding area. 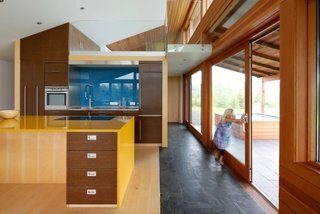 This deluxe villa is surrounded by beautiful nature including a river, lake, and hiking trails. 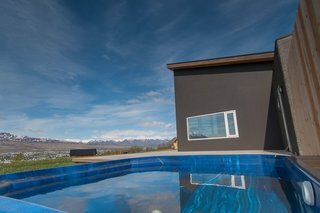 Located in the beautiful Svínadalur valley, the home offers easy access to the western part of Iceland and is only 40 minutes from the center of Reykjavik. 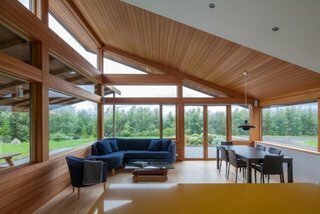 With a mix of dark wood and stone walls, the single-level home can accommodate 10 people. 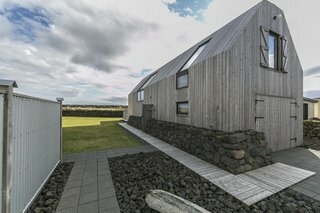 This unique property was built to reflect the Icelandic landscape and complement the surrounding vegetation of moss and trees in the old lava field where it's located. 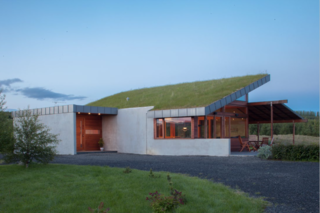 The property was constructed to be sustainable with green features including a system that allows geothermal water to run through pipes, keeping the floor warm and comfortable year-round.